Engineers worldwide hunted for a solution. 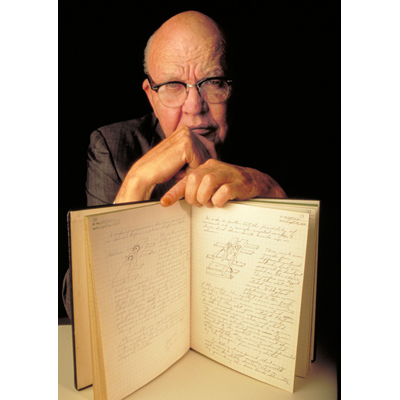 TI mounted large-scale research efforts and recruited engineers from coast to coast, including Jack Kilby in 1958. At the time, TI was exploring a design called the “micromodule,” in which all the parts of a circuit were equal in size and shape. Kilby was skeptical, largely because it didn’t solve the basic problem: the number of transistor components. While his colleagues enjoyed a two-week summer hiatus, Kilby, a new TI employee without any accrued vacation time, worked alone on an alternative in his TI lab. TI had already spent millions developing machinery and techniques for working with silicon, so Kilby sought a way to fabricate all of the circuit’s components, including capacitors and resistors, with a monolithic block of the same material. He sketched a rough design of the first integrated circuit in his notebook on July 24, 1958. Two months passed before Kilby’s managers, preoccupied with pursuing the “micromodule” concept, gathered in Kilby’s office for the first successful demonstration of the integrated circuit. Kilby’s invention made obsolete the hand-soldering of thousands of components, while allowing for Henry Ford-style mass production. In February of 1959, Kilby filed for a patent on his invention.